Bredäng Camping is open: 15th of April – 6th of October 2019. 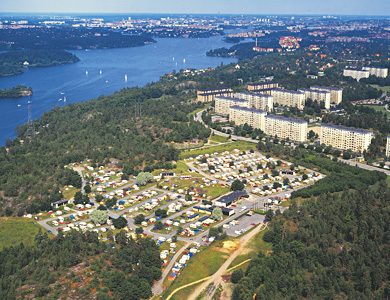 Attractively located camping site close to Lake Mälaren and 350 meters from the Mälarhöjdens open-air swimming area. Grassland area with trees, surrounded by planted embankments. Minigolf. Indoor swimming pool 2 km. Tennis 1 km. IKEA and Heron City 3 km. Hot water included in the camping price. All of the hot water comes from eco-friendly district heating. Located 10 km south-west of central Stockholm. From the E4/E20: Turn off towards Bredäng and follow the camping signs. Nearest shopping centre and Bredäng underground station 700 meter. During the summer there are also boat services from Mälarhöjdsbadet to Drottningholm Palace and Stockholm City Hall. Hostel. 4-bed rooms and cottages. 4-star servicehouses. Shop and restaurant.